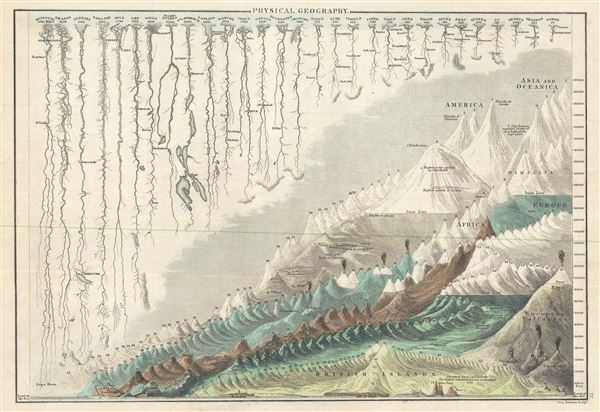 This is a beautiful example of Adam and Charles Black's 1844 comparative mountains and rivers of the world chart. Charts of this type were first introduced in England around 1823 and became a common feature in atlases throughout the 19th century. The present example is admired as one of the more attractive British examples of the style. The comparative mountains section, occupying the lower right half of this chart, details the principle mountains of the world. Ranges are color coded to show different continents. The elevations of a number of important cities including Riobamba, London, Gibraltar, Toluca, and Quito, among others, are noted. There are also extensive notations on vegetation, volcanic activity, and lichen, much of which is no doubt influenced by Humboldt. The Himalayan peak is identified as the world's greatest mountain. Even the ballooning feat of Gay-Lussac who attained an altitude of 7000 meters in 1808 is noted. It is interesting to note that while the style is international, Black has tooled this map to appeal to his British client base. Sites of exceptionally interest to the British Islanders, including the 'highest inhabited place in Scotland' and the Convent of St. Gothard, are specifically identified. The upper left portion of this chart is dominated by the world's greatest rivers. Black attempts not only to express the lengths of the various rivers, but also details their course and sources. Here the Missouri is identified as the world's greatest river at some 3610 miles, followed by the Amazon at 3130 miles. The Nile comes up a sad fifth at just 2700 miles, though admittedly its full length had yet to be explored. George Aikman (December 28, 1788 - October 16, 1865) was a Scottish printer, lithographer, and engraver active in the early 19th century. Aikman most likely apprenticed with his father of the same name, also an engraver, before joining the Edinburgh map and atlas firm of William Lizars. Several years later Aikman established himself independently as "George Aikman and Sons, Engravers and Lithographers", publishing numerous maps and prints in conjunction with the larger firm of William and Charles Black, and others. George Aikman's son, also George (1830 - 1905), became an apprentice with the firm around 1842, and eventually a journeyman engraver in Manchester and London, before returning to Edinburgh to take up a full partnership in the family business. Upon the elder Aikman's death in 1865, George became the sole proprietor of the firm and continued to publish until 1876 when he sold the business to pursue a passion for landscape painting. Rumsey 2305.008 (1854 edition). Philips (atlases) 4334.